Most Linux distributions have a package management system with online repositories containing thousands of packages. This makes it very easy to install and remove applications, operating system components, documentation and much more. We first discuss the Debian package format .deb and its tools dpkg, apt-get and aptitude. This should be similar on Debian, Ubuntu, Mint and all derived distributions. Then we look at the Red Hat package format .rpm and its tools rpm and yum. This should be similar on Red Hat, Fedora, CentOS and all derived distributions. A lot of software and documentation for your Linux distribution is available as packages in one or more centrally distributed repositories. These packages in such a repository are tested and very easy to install (or remove) with a graphical or command line installer. Debian, Ubuntu, Mint and all derivatives from Debian and Ubuntu use .deb packages. To manage software on these systems, you can use aptitude or apt-get, both these tools are a front end for dpkg. Red Hat, Fedora, CentOS, OpenSUSE, Mandriva, Red Flag and others use .rpm packages. The tools to manage software packages on these systems are yum and rpm. Some packages need other packages to function. Tools like apt-get, aptitude and yum will install all dependencies you need. When using dpkg or rpm, or when building from source, you will need to install dependencies yourself. These repositories contain a lot of independent open source software. Often the source code is customized to integrate better with your distribution. Most distributions also offer this modified source code as a package in one or more source repositories. You are free to go to the project website itself (samba.org, apache.org, github.com, ...) an download the vanilla (= without the custom distribution changes) source code. End users have several graphical applications available via the desktop (look for 'add/remove software' or something similar). 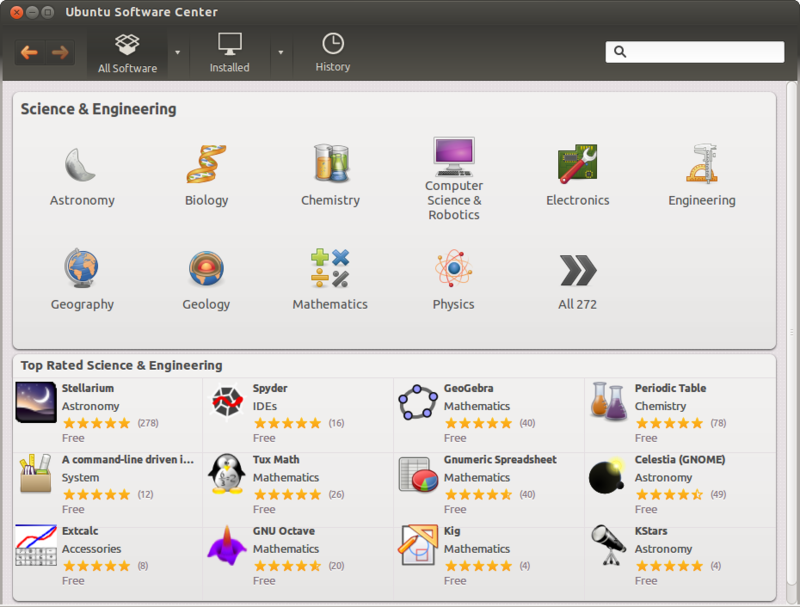 Below a screenshot of Ubuntu Software Center running on Ubuntu 12.04. Graphical tools are not discussed in this book. Most people use aptitude or apt-get to manage their Debian/Ubuntu family of Linux distributions. Both are a front end for dpkg and are themselves a back end for synaptic and other graphical tools. The low level tool to work with .deb packages is dpkg. Here you see how to obtain a list of all installed packages on a Debian server. Compare this to the same list on a Ubuntu Desktop computer. Here is an example on how to get information on an individual package. The ii at the beginning means the package is installed. You can find the package that installed a certain file on your computer with dpkg -S. This example shows how to find the package for three files on a typical Debian server. You can also get a list of all files that are installed by a certain program. Below is the list for the tmux package. You could use dpkg -i to install a package and dpkg -r to remove a package, but you'd have to manually keep track of dependencies. Using apt-get or aptitude is much easier. Debian has been using apt-get to manage packages since 1998. Today Debian and many Debian-based distributions still actively support apt-get, though some experts claim aptitude is better at handling dependencies than apt-get. Both commands use the same configuration files and can be used alternately; whenever you see apt-get in documentation, feel free to type aptitude. We will start with apt-get and discuss aptitude in the next section. When typing apt-get update you are downloading the names, versions and short description of all packages available on all configured repositories for your system. In the example below you can see some repositories at the url be.archive.ubuntu.com because this computer was installed in Belgium. This url can be different for you. Run apt-get update every time before performing other package operations. One of the nicest features of apt-get is that it allows for a secure update of all software currently installed on your computer with just one command. The above screenshot shows that all software is updated to the latest version available for my distribution. apt-get keeps a copy of downloaded packages in /var/cache/apt/archives, as can be seen in this screenshot. Running apt-get clean removes all .deb files from that directory. Use apt-cache search to search for availability of a package. Here we look for rsync. You can install one or more applications by appending their name behind apt-get install. The screenshot shows how to install the rsync package. Need to get 299 kB of archives. After this operation, 634 kB of additional disk space will be used. You can remove one or more applications by appending their name behind apt-get remove. The screenshot shows how to remove the rsync package. 0 upgraded, 0 newly installed, 2 to remove and 8 not upgraded. After this operation, 692 kB disk space will be freed. Note however that some configuration information is not removed. You can purge one or more applications by appending their name behind apt-get purge. Purging will also remove all existing configuration files related to that application. The screenshot shows how to purge the rsync package. 0 upgraded, 0 newly installed, 1 to remove and 8 not upgraded. Note that dpkg has no information about a purged package, except that it is uninstalled and no configuration is left on the system. Most people use aptitude for package management on Debian, Mint and Ubuntu systems. To synchronize with the repositories. To patch and upgrade all software to the latest version on Debian. To patch and upgrade all software to the latest version on Ubuntu and Mint. To install an application with all dependencies. To search the repositories for applications that contain a certain string in their name or description. To remove an application and all configuration files. Both apt-get and aptitude use the same configuration information in /etc/apt/. Thus adding a repository for one of them, will automatically add it for both. The resource list used by apt-get and aptitude is located in /etc/apt/sources.list. This file contains a list of http or ftp sources where packages for the distribution can be downloaded. This is what that list looks like on my Debian server. On my Ubuntu there are four times as many online repositories in use. There is much more to learn about apt, explore commands like add-apt-repository, apt-key and apropos apt. The Red Hat package manager can be used on the command line with rpm or in a graphical way going to Applications--System Settings--Add/Remove Applications. Type rpm --help to see some of the options. Software distributed in the rpm format will be named foo-version.platform.rpm . To obtain a list of all installed software, use the rpm -qa command. To verify whether one package is installed, use rpm -q. To install or upgrade a package, use the -Uvh switches. The -U switch is the same as -i for install, except that older versions of the software are removed. The -vh switches are for nicer output. To remove a package, use the -e switch. rpm -e verifies dependencies, and thus will prevent you from accidentailly erasing packages that are needed by other packages. The rpm database is located at /var/lib/rpm. This database contains all meta information about packages that are installed (via rpm). It keeps track of all files, which enables complete removes of software. We can use rpm2cpio to convert an rpm to a cpio archive. But why would you want to do this ? Perhaps just to see of list of files in the rpm file. Or to extract one file from an rpm package. The Yellowdog Updater, Modified (yum) is an easier command to work with rpm packages. It is installed by default on Fedora and Red Hat Enterprise Linux since version 5.2. Issue yum list available to see a list of available packages. The available parameter is optional. Issue yum list $package to get all versions (in different repositories) of one package. To search for a package containing a certain string in the description or name use yum search $string. To search for a package containing a certain file (you might need for compiling things) use yum provides $filename. To install an application, use yum install $package. Naturally yum will install all the necessary dependencies. You can add more than one parameter here. To bring all applications up to date, by downloading and installing them, issue yum update. All software that was installed via yum will be updated to the latest version that is available in the repository. If you only want to update one package, use yum update $package. Issue yum grouplist to see a list of all available software groups. To install a set of applications, brought together via a group, use yum groupinstall $groupname. Read the manual page of yum for more information about managing groups in yum. The configuration of yum repositories is done in /etc/yum/yum.conf and /etc/yum/repos.d/. Configurating yum itself is done in /etc/yum.conf. This file will contain the location of a log file and a cache directory for yum and can also contain a list of repositories. Recently yum started accepting several repo files with each file containing a list of repositories. These repo files are located in the /etc/yum.repos.d/ directory. One important flag for yum is enablerepo. Use this command if you want to use a repository that is not enabled by default. alien is experimental software that converts between rpm and deb package formats (and others). Below an example of how to use alien to convert an rpm package to a deb package. In real life, use the netcat tool provided by your distribution, or use the .deb file from their website. First and most important, whenever you download software, start by reading the README file! Normally the readme will explain what to do after download. You will probably receive a .tar.gz or a .tgz file. Read the documentation, then put the compressed file in a directory. You can use the following to find out where the package wants to install. Replace the z with a j when the file ends in .tar.bz2. The tar, gzip and bzip2 commands are explained in detail in the Linux Fundamentals course. If you download a .deb file, then you'll have to use dpkg to install it, .rpm's can be installed with the rpm command. First and most important, whenever you download source code for installation, start by reading the README file! Usually the steps are always the same three : running ./configure followed by make (which is the actual compiling) and then by make install to copy the files to their proper location. 1. Verify whether gcc, sudo and wesnoth are installed. 2. Use yum or aptitude to search for and install the scp, tmux, and man-pages packages. Did you find them all ? 3. Search the internet for 'webmin' and figure out how to install it. 4. If time permits, search for and install samba including the samba docs pdf files (thousands of pages in two pdf's). Google should point you to webmin.com. There are several formats available there choose .rpm, .deb or .tgz .